Our family got started in the Christmas Tree business back in the early 1950’s when my father Fred Beresford started cutting wild trees in the mountains of Northern California which is where our family has lived since the late 1800’s. He then started retailing these trees in the Bay area. Silver Tip ( Abies Magnifica) and White Fir (Abies Concolor) were the two types of trees that he was cutting. Using two-wheel drive trucks, handsaws and going into the unknown cutting areas in the high elevations was a challenge to Fred and his two man crew. However he was able to harvest his trees for his personal retail lot as well as some extra trees that he sold to other retailers. After a few years Fred bought some 4-wheel drive “power wagons”, and some gas powered chain saws and this made the harvest more manageable. He then aquired some lease areas from local timber companies and was able to plan out his harvest and have a predictable inventory. Fred soon was able to leave his family’s resort business and concentrate full time on his Christmas trees. More time passed and Freds business grew to where he wanted to raise trees on a plantation where the operation would be easier to manage. So Fred, Sue (his wife), Joann (his sister) and her husband purchased some ground at a lower elevation and started a Christmas tree farm. Needless to say this new adventure was a learning process of its own which was another enjoyable challenge for Fred. Fred still managed his high elevation lease areas as these areas naturally provided very nice trees but soon was culturing these natural stand areas to produce high quality White Fir and Silver Tip. Which at the time were the big sellers in California. He also found he could harvest from the natural stand areas, large Christmas trees up to 80 feet tall. 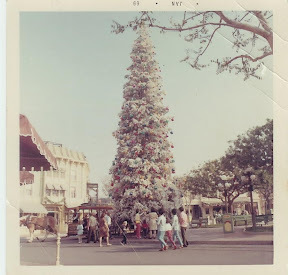 And in 1971 Fred was proud to provide Disneyland with an 80 foot White Fir from the family property in Mineral CA. Thus bringing Fred a new market in the selling of large Christmas Trees. As the trees that had been planted on the plantation continued to grow, Fred developed new techniques to slow them down and fill them in to produce a high quality tree for his customers. This is where I got my start in Sierra Cascade. I started working for my father at the age of 13. I worked every summer on the tree farm and in the woods learning every aspect from the ground up. Most of the work was done by the piece so the harder you worked to more money you made. Through this pay I have found that this aspect has not changed even though the industry has. After I finished school I couldn’t wait to go to work for my father full time. I was then encouraged by my dad to start my own retail lot, thus starting my own branch of the family tradition and opening my first lot in 1983 in the Bay Area. In the early 80’s we noticed the market had changed and some very nice trees from Oregon growers were quickly starting to take a big share of the market in California. In 1984 Fred started a plantation of Noble Fir in the Willamette Valley on Oregon. So here it is 25 years later and I am still raising trees in Oregon and now am retailing in Chico California, among some other things along the way. 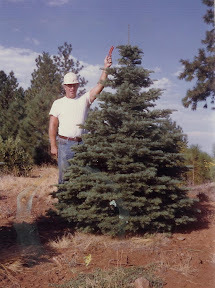 We now raise four species of trees in Oregon and still harvest Silver Tip and White Fir in the mountains of California. As the world changes and we all grow older, Christmas still is a very cherished time of year. We would like to provide you with a quality tree for your family or for customers of your own. So if you just want one tree or one thousand trees, many years of hard work and experience is behind us to provide that for you.